This FJ43 splits its time between the busy streets of Chicago and the quaint mountainside town of Aspen. 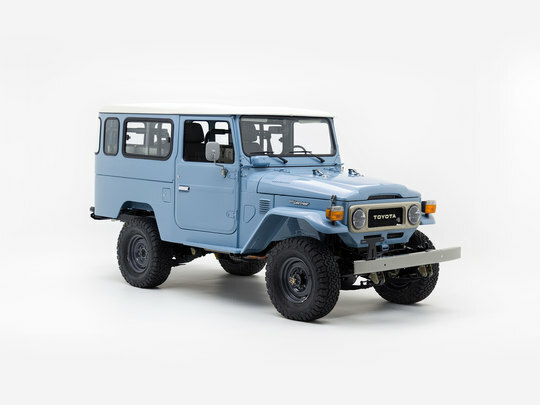 A versatile hardtop with a vintage vibe, this FJ43 is ready for almost anything. This Land Cruiser’s exterior preserves the look of the original and includes modern essentials that no driver should be without - LED lighting for safety and a few carefully chosen accessories that stay true to the Land Cruiser legend. The custom hardtop adds another layer of insulation from the outside world, reducing drafts and road noise. Can a Land Cruiser handle the rigors of highway and city driving? Of course, it can! And the extra horsepower of the Toyota 1FZ engine and 5-speed transmission give it a distinct edge over the original. Added steering stability and 4-wheel disc brakes add more control and stopping power, while new suspension and revitalized four-wheel drive components make this rig a force to be reckoned with — pavement or trail. When you own a Land Cruiser by The FJ Company, you look forward to getting behind the wheel every chance you get. Up front, heated Corbeau Sport seats, exposed bolts, and classic gauges take center stage, while subtle modern conveniences bring the cabin to your desired comfort level. With a 1GR-FE engine and other modern upgrades, the G40 Expedition by The FJ Company takes the classic 4x4 into uncharted territory. Customize yours!